It happens so quickly there’s virtually no time for second thoughts. After a rapid-fire pre-flight check of seatbelts, helmets and fuel delivery, pilot Stephen Conte fires up the engine, the propeller’s backwash fills the trailing parachute and our spindly conveyance goes bumping across what looks suspiciously like a cow paddock. After barely 15 metres the wheels stop hitting the bumps and begin to float: we are airborne, and climbing into the wide blue yonder. This is flying, no doubt about it. We’re just beyond Melbourne’s suburban fringe near Werribee and there’s the city in the distance, Port Phillip Bay to the right and the Dandenongs far beyond. Directly below, the flat fields have visually expanded: the hills on the horizon are now almost touchable, there are tracks, dams, windmills and yes indeed, plenty of cows. Business class travel it isn’t. Pilot and passenger are crammed onto a small settee and apart from the seatbelt there’s nothing between you and the elements apart, of course, from an amply stuffed pair of overalls to keep the wind at bay. I see my knees, the tips of my boots then the ground below. Welcome to the world of Aerochutes, surely one of the cheapest ways to achieve powered flight in absolute safety. If you’ve ever dreamed of becoming a pilot but don’t have the time or money to get your licence then how does this sound: spend as little as five hours being taught how to take off, steer and land an Aerochute and you’re ready for solo flying. It’s that easy. Alternatively you can turn up on a Sunday morning and just go for a ride, like we did. Part of the secret to an Aerochute’s accessibility is the simplicity of the machine itself. This particular example is manufactured in Melbourne by Aerochute International Pty Ltd, a company not coincidentally owned by my pilot. It consists of a roughly triangular frame with a Rotax two-stroke engine and propeller mounted on the back, a seat at the front, four wheels underneath and a few basic instruments. And that’s about it except, of course, for the chute which acts as a wing for lift. It is also a fairly comprehensive safety device because it cannot be stalled (lose lift, that is), does not spiral and if the engine should cut out it lowers the whole shebang reasonably gently to earth, much like a normal parachute. The whole thing fits comfortably into a medium sized trailer and keen Aerochutists tend to take their aircraft on holidays with them. Get permission to use a suitably flat piece of ground, keep out of restricted air spaces and you could be whale watching off the coast, circling the Bungle Bungles in Western Australia or checking out any of Australia’s marvels from the air. There are costs involved, of course, not least of which is purchasing your very own flying machine. 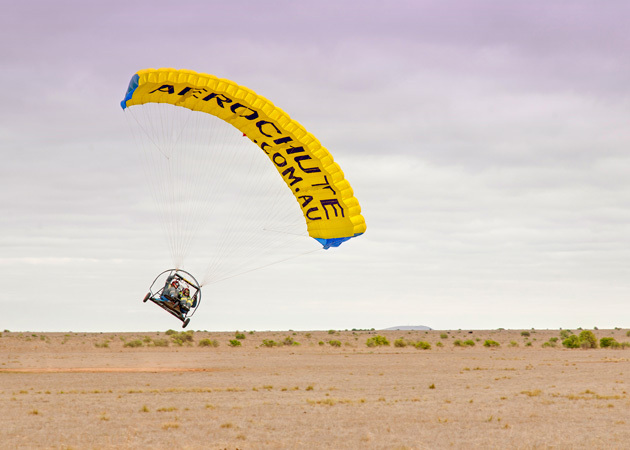 Aerochute International has two models, the basic 52 horsepower Aerochute for around $20,000 or the more powerful Hummerchute which can carry more weight and costs around $26,000. That’s fully built to Civil Aviation Safety Authority (CASA) standards and includes everything from the engine, the chute and even air in the tyres. It’s not chickenfeed, but it’s a lot less than a Cessna. Far from being a backyard operation, the company employs 10 people and is an Aussie export success story with its Aerochutes going to the USA and Europe where they are valued for their light but strong frames and handy side-by-side seating arrangement. So, how do they go? Top speed is limited to about 70km/h mainly because the 10 metre-wide chute creates plenty of aerodynamic drag as well as lift. Perhaps more importantly they can go much slower if you want to get down to treetop level and investigate something interesting. Maximum legal ceiling height is 5000 feet although because “our” cow paddock is not far from Avalon Airport we don’t go above 1000 feet. Which seems plenty, given we’re basically in a propeller-driven go-kart hanging from a nylon bag. And that’s what we do for a good half hour, buzzing around the area, heading down almost to ground level to follow a rutted track, practise a few touch-and-go landings and some steep turns. 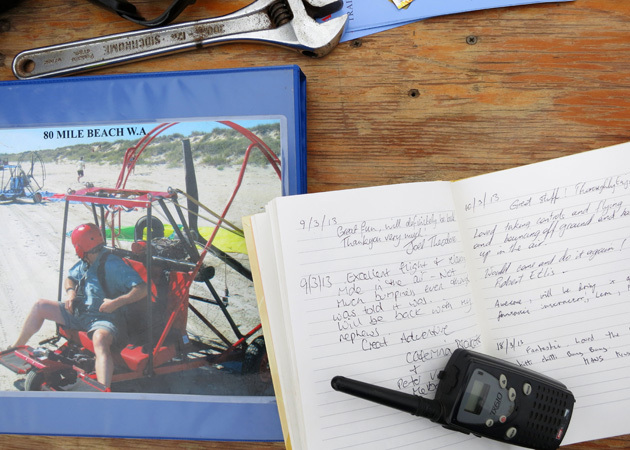 There’s a pilot-to-passenger intercom and a radio to contact other flyers but considering you have everything hanging out in the breeze, sometimes it’s just as easy to wave. The controls are amazingly simple: there’s a foot operated throttle for maximum power on take off and steering is done by pulling the chute’s two cords to turn left or right. Throttle down to land, flare the chute back like a parachutist and you’re back in the paddock. Conte is a qualified instructor and has taught hundreds how to do it. 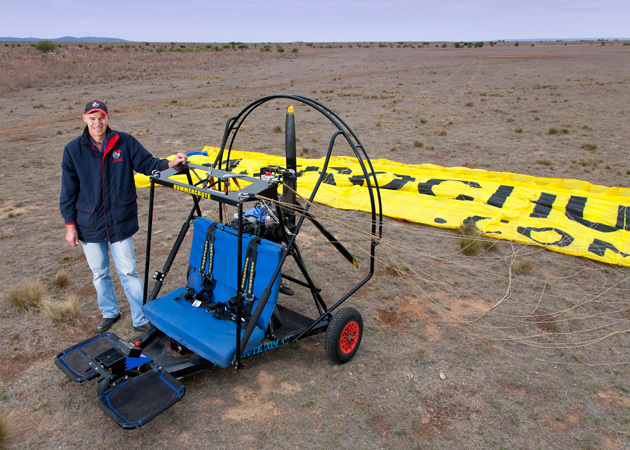 There’s a club, of course, called the Aerochute Association of Australia which operates out of Victoria, although members are from all over the country and even New Zealand and the USA. They’re hoping to get the biggest massed flight of at least 38 Aerochutists airborne sometime soon, which might even make Werribee’s nonchalant bovine population give a second glance upwards. On this particular Sunday morning there’s just the four Aerochutes, two taking some pretty excited civilians on joy flights, the others just there for the flying. It’s all very pleasant and you can’t help feeling this was how flying used to be: no airports, queues or aggravation, just a bunch of guys and gals in a paddock tinkering with machines then taking them for a spurt. It’s something anyone with half a hankering to get airborne could get used to.